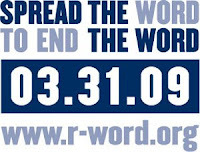 Just a reminder, today is "Spread the Word to End the Word Day." 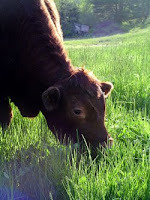 Cynthia Lord wrote a beautiful post about this day on her website. Yesterday, I talked to my students about this very important day. We went to the website and signed the pledge. Today we will watch a video and make posters. Randall Mackey is walking home from his friend Jaybird's house one night when he sees Queenie Avery, an elderly neighbor, shuffling down the street in her nightgown and high heels, clutching her red purse to her chest. Queenie has always been a friend of Randall's, but lately she has begun to act a little strange, and folks in Randall's small southern town are starting to wonder whether she might need more care than her husband can provide. Randall follows Queenie, and in the process, he sees a mother leave her baby, in a cardboard box, on the steps of the Rock of Ages Baptist Church. Over the next few weeks, the entire town begins to squabble about who will take care of Baby Moses. The pastor's wife, Mrs. Jennings, doesn't have her own children and believes Moses was left specifically for her. Miss Frieda is a licensed foster care mother and thinks she should take care of Moses. Soon everyone is taking sides. Randall could solve the problem, but he is afraid to tell anyone his secret, because he doesn't want people to know about Queenie's wanderings. I loved O'Connor's portrayal of the Rock of Ages Baptist Church. Imperfect people leading imperfect lives, but doing the best that they can, despite their faults, to love and care for each other. In my mind, that's about as good as the church ever gets. Real characters. Real problems. Real truths. Real goodness. Another terrific read by Barbara O'Connor. I think I was in kindergarten when my mom taught me the rhyme, "Sticks and stones may break my bones, but names will never hurt me." I don't remember why she taught it to me, but I remember chanting it over and over and over again. Now, forty some years later, I would never teach that rhyme to my kids or anyone else's, because I believe it is totally untrue. Words do hurt. They hurt a lot. Much, much worse than sticks or stones ever could. And the hurt inflicted by words lasts much longer than the pain of a physical beating. Franki, at Year of Reading, made me aware that Tuesday, March 31st, is a really important day. Tuesday is "Spread the Word to End the Word." Sponsored by the Special Olympics, "Spread the Word" is "a National Awareness Day to raise awareness of the hurtful effects of the word “retard(ed)” and encourage people to pledge to stop using it." I pledge and support the elimination of the derogatory use of the r-word from everyday speech and promote the acceptance and inclusion of people with intellectual disabilities. At "Year of Reading," Franki has posted a terrific list of children's literature that might open up some conversations about this topic. Tomorrow is our first day back from Spring Break. We are going to explore this website. We're going to take the pledge and make posters to put up around our school. I want my kids to understand that words have the power to harm or to do good. We are going to use our words- reading, writing, and speaking- to help stop the use of that one very harmful word. I'm a long time Douglas Florian fan. Last fall, I reviewed AUTUMNBLINGS. I also love lots of his other books, e.g. LAUGHETERIA and BOW WOW MEOW MEOW. 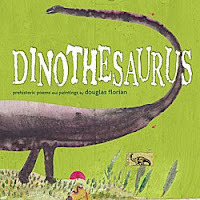 A couple of weeks ago, I entered a contest on Kelly Polark's blog (check out the fun end of winter poem she posted for Poetry Friday today) to win Florian's newest book, DINOTHESAURUS: PREHISTORIC POEMS AND PAINTINGS. And miracle of miracles, I won! The book came today and it's terrific- one of Florian's best, I think! DINOTHESAURUS is twenty poems about dinosaurs. The first and last poems are about dinosaurs in general, each of the other eighteen is about a different kind of dinosaur. The poems are Florian clever- lots and lots of his usual clever word play, e.g. "Seisomaurus: tremendous in size; Seisomaurus: stupendous lengthwise" or the end lines from the poem about T Rex, "I find it terrific that it's T-rex-tinct." And then there's the poem about stegoceras, "Thick head. Brick head. Hard head too." Or micropachycephalosaurus, that 20-inch dinosaur with the extra-long name. And I can't leave out "The pterrifying pterosaurs" that "flew ptours the ptime of dinosaurs." Every single poem in this book is terrific- perfectly written, so they are fun to read, even for the kids who struggle, but also chockful of interesting facts and wonderful words that hand around and velcro into kids' mouths and brains and hearts. Florian's illustrations are as quirky and fun as the poems. They're done in collage, with all different kinds of materials, and words, and surprises. The brachiosaurus, for example, is longer than a tennis court, bigger than a barge, and looks much like a crane. Guess what three objects are hidden in the illustration. Fun, fun, fun! A "Glossarysaurus" gives readers facts about each of the dinosaur museums and fossil sites. A bibliography gives ideas for further research about dinosaurs. I can't wait to share this with kids on Monday! I vaguely remember reading CATCHER IN THE RYE when I was in high school, but I didn't remember much about it, so when Z had to read it for freshman English, I read along with him. As we plowed through CATCHER IN THE RYE BREAD (K's title), I could not help but wonder whether it is really necessary for every single high school student in America to read this "classic." What is my son, growing up in a middle class, single parent midwest home supposed to learn from Holden Caufield, a privileged white boy attending boarding school on the East Coast fifty years ago? Are there not other coming of age novels that might be more representative of the typical high school kids' experience? At the very least, would it not be worthwhile to read several different coming of age novels, or sections of novels, with the goal of comparing different parts of the country or world, different time periods, and different socioeconomic groups? This week, I read a novel, that I think could replace, or at least complement CATCHER IN THE RYE. NEW BOY is the story of Rob Garrett, an African American teenager growing up in Virginia in the late 50's or early 1960's. As the book opens, Rob's parents, a dentist and school teacher, are dropping him off at Draper, an exclusive boarding school in Connecticut. Rob will be the first black student to attend Draper and his Aunt Gwen advises him that he would "do well to keep to himself until he sees what he is dealing with." Rob heeds her advice and has a successful, albeit lonely, year at Draper. Predictably, issues of race do come up in this book. Over Thanksgiving vacation, Rob visits an elderly aunt in Harlem. He gets a ride from the train station with a classmate whose black chauffeur is visibly angry at Rob's more privileged status. He also visits an African American book store, and has a chance encounter with Malcolm X. Julian Houston embeds a great deal of history into these portions of the book, some reviewers have felt that there was "too much information," to coin my sons' favorite phrase. I enjoyed Houston's insights and didn't feel like the history was overwhelming at all. The climax of the book deals directly with the Civil Rights movement. Throughout the book, Rob maintains contact with several high school friends from home. The friends are very involved in Civil Rights activities, and stage a sit-in at the Woolworth's lunch counter. These chapters, along with voting chapters from SECRET LIFE OF BEES would be terrific read alouds in any middle school or high school history class. Unpredictably, Rob is not the main target of prejudice at the boarding school. At a meeting for new students, Rob meets Vinnie, an Italian-American student from New York. The boys at Draper tease Vinnie mercilessly- making fun of his Italian heritage and his acne-ridden face. Finally they ostracize him so totally that he is forced to move out of the dormitory. The headmaster and teachers at the school do nothing, mostly because Vinnie does not come from the old money families at the school. I can only imagine the rich discussions that might arise from closer examinations of this character. My computer has been out of commission since last Tuesday, and in the shop since Thursday. I finally got it back this morning- PHEW! While I've totally missed being on line, and being able to post, check email, etc., I definitely have gotten some stuff done, e.g. housework and laundry (now if I would just get my act together and work on taxes). We are on spring break this week, so I've also gotten in some good reading time. Just finished THE WRITING ON MY FOREHEAD, a perfect escape for someone whose spring break is being spent far from the beach that she is longing for! THE WRITING ON MY FOREHEAD is the story of Saira, a woman of Eastern Indian descent, whose parents emigrated to Los Angeles long before Saira was born. Her father is a doctor, and her mother, a stay-at-home mom who works hard to maintain the family's Indian/Pakistani heritage in a world far removed from where she was raised. Saira's older sister, Ameena, is comfortable with her mother's cultural expectations. Saira, however, is unwilling to live with her parents', and especially her mother's, rules from this faraway place. THE WRITING ON MY FOREHEAD is a coming of age novel. When the book opens, Saira is an adult, caring for Ameena's six-year-old daughter, Sakina. 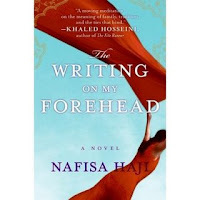 The reader is quickly taken back to Saira's childhood and adolescent years, which include regular trips to the family's homeland, including one visit where Saira, travelling alone, learns new and surprising things about her family. Through these visits, the reader learns much about the history and traditions of India and Pakistan. My computer is sick! I have to take it to the shop and may be off line for a few days! Or years, depending on how much it costs to repair it! This has been a long hard week. My 9-month-old lab puppy ate a dishtowel. So far, it has cost $4600 dollars to get the $1.29 dishtowel out of the dog's stomach. And the vet thinks I am a bad dog mother because I'm having a hard time working full time and parenting full time and putting compresses on the dog's incision four times a day and giving five kinds of medicine twice a day. And we have spent two weeks giving the state tests to our kids. And I have watched kids who only get to go to the zoo, which is about a mile from our school, a couple of times a year when we take them, struggle valiantly to understand passages about deep sea fishing and tap dancing lessons. And teachers who care enough to buy kids' clothes and give up Saturdays to take kids on outings weep because they are not good enough teachers to help kids understand passages about deep sea fishing and tap dance lessons. And I'm in charge of passing out the tests, and counting, and cleaning up, and bubbling. And every time I look at the books I feel like I am violating my soul. Weeks like this, I need poetry. Like Sarah Lewis Holmes' breathtaking "Annus Mirabilis." Or Michael Blumenthal's "What I Believe," that MaryLee posted this morning. And Kay Ryan's "Bad Day." To remind me that tomorrow is another day. And there will be new dreams. And hopes. And miracles. POETRY FRIDAY is at THE MISS RUMPHIUS EFFECT. There's a terrific blog tour going on this week. It's called SHARE A STORY, SHAPE A FUTURE. The calendar for the entire week is here. This morning, as part of the series, the READING ZONE has a post on READ-ALIKES. The READ ALIKE idea is exactly what we've been trying to do with the book stepladders, "If you liked …, you might also like…" Yesterday, I also especially enjoyed a piece on GIFTED READERS, and one on STRUGGLING READERS. Today, MaryLee's piece on USING NONFICTION IN READ ALOUD was terrific! Oh heck, actually they've all been terrific! Check out this fabulous series!!!! This morning I wrote about Book Stepladders. Lots of times, when I talk to teachers about student engagement, and connecting the right kid with the right book, people say that they don't have the expertise/knowledge of books, to do this. My thought is, then, that I would like to create some lists of increasingly "harder" (and I'm still not comfortable with that word), so that teachers could help kids move further and further into the big, wide world of books. I was thrilled to get several comments- some from folks I know and some from people I have never heard from before. Franki suggested that she's done/is doing some "If you like..., you might also like..." C.A.T. said to check the Teachers' College Reading and Writing Project website because they do something similar called "Book Ladders." I did check the site, but didn't find this topic. Several people offered to help put some book ladders together, so I say, "Let's go for it. The more the merrier." Here are some lists I'm thinking about. These are just beginnings…Feel free to suggest stuff and I will add it, or suggest some new topics. This is just a start. Feel free to post a comment and we'll keep working on this. 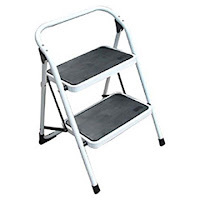 This morning I'm thinking about stepladders. No, not actual stepladders, although those are certainly a constant in this not quite 5 foot woman's life. This morning, I'm thinking about a concept I'm calling BOOK STEPLADDERS. It is, as my friend JoAnn would say, an infant idea, or maybe it's an idea someone else has already been nursing for years, but this morning it's on my thinking radar screen. I'm thinking of book stepladders as mini-collections of books that help kids step into the big wide world of literacy. For instance, say a reader loves JUNIE B. JONES. I'd like, as a teacher, for her to hang out with Junie B. for a while, but at some point I also want to be ready to help her take one step up as a reader (that phrase doesn't feel quite right to me, it kind of implies a hierarchy of easier and harder books, with harder ones being better, and that's not exactly what I mean, but it's Sunday morning, and church, and the grocery store and housework are screaming my name and I don't have time to play with it). If I were thinking in terms of stepladders, I might offer MOXY MAXWELL, or the CLEMENTINE SERIES, then maybe AMBER BROWN, or RAMONA. After that, I might try to move this reader out into the world of authors, e.g. Barbara O'Connor. Thinking about some of the other readers in my life: a stepladder might start with CAPTAIN UNDERPANTS, but would also include the WIMPY KID series, and Sherman Alexie's DIARY OF A PART TIME INDIAN. There are probably other steps in there between WIMPY KID and INDIAN, but I have to think about them some more. I envision setting up book stepladders by subject (e.g. books about horses, or genre, or author, or ???). As someone who loves children's books, and loves to read, I can do some of this without even thinking. I know lots and lots of kids' books, and it's not that hard for me to reach into the book bag in my head, and pull out a book that matches a particular reader with authors and genre I love, e.g. realistic or historical fiction. There are certain other genre, however, fantasy, animal fantasy, or science fiction, that I don't love, and don't read as regularly, where I would have a harder time applying this concept. I'm also thinking about my colleagues who don't know and love children's literature like I do. How might I organize this information (database?, online?) in ways that would support them? How could I draw on the expertise of my friends in kids' litosphere to create bunches of book stepladders for educators and librarians to use? Poetry Friday is at PICTURE BOOK OF THE DAY. As a teacher, there are some situations that I hope my students never have to face. Loss of a pet. A serious illness. The death of a parent or grandparent, or friend or sibling. Sadly, life happens, and these situations are inevitable. When they occur, I want to be ready. And as anyone who knows me will tell you, for me, part of being ready means having the right book. Throughout my career I've assembled a small collection of books I go to when children are grieving: BADGER'S PARTING GIFT, FIG PUDDING, MISSING MAY, and MICK HARTE WAS HERE, when they are missing a person or DOG/CAT HEAVEN and THE TENTH GOOD THING ABOUT BARNEY for a four-legged friend. Yesterday I found a new book to add to this collection. REMEMBERING MRS. ROSSI is a story of loss, and missing, and beginning again. The book begins with a brief, almost fairy tale-ish prologue Annie Rossi is eight years old. She lives with her mother, a sixth grade teacher, and father, a professor, in an apartment in New York City, and summers in a cottage at the beach. One day Annie's mother gets sick. She is taken to the hospital and dies of pneumonia. The book traces Annie and her father's journey over that long, hard, first year of re-creating their lift together. Mr. Rossi has to work, and can't indulge in Annie's favorite snowy day traditions, so he takes her to his college class. Annie doesn't know how to make a birthday cake, so she and a beloved babysitter buy chocolate cupcakes for her father's special day. That summer, Annie and her father remake their life at the beach. In one of the first chapters, Annie and her father go to an assembly at her mother's school. Mrs. Rossi's class presents them with REMEMBERING MRS. ROSSI, a book they have written in honor of their beloved teacher. Each child has contributed something- a story, or poem, and even a science experiment, sharing their favorite memories of Mrs. Rossi, or their feelings about her death. Annie keeps the book under her mattress and reads it every night before she goes to bed. All of these student entries are included in the back of Amy Hest's wonderful book. (From a writing teacher's point of view, I'd love to share these entries with kids as mentor texts for writing character sketches or sympathy notes. I'd also share the note Annie writes to the class to thank them for the book). 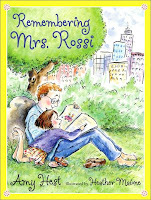 REMEMBERING MRS. ROSSI is an important addition to any library. It's a sad, yet hopeful book, about beginning again. It's a book I hope I never have to use, but it's also a book I'm very glad to have found. One of my most vivid childhood pet memories involves a gerbil. And his tail. And my father. And a little blood (my father's, not the gerbil's). And several words not appropriate for a children's literature blog. A brief synopsis of that story: Cathy Phillips gave us pet gerbils. My dad was trying to pick up one of the gerbils. You were supposed to pick up gerbils by the tail, but you had to stay pretty close to their body. My dad got too far away. The gerbil somehow bit my dad. The gerbil's tail fell off. My dad swore. Ever since that time, I've had a fascination with animals that have parts that come off and grow back. Gerbils. Starfish. And now skinks. LITTLE SKINK'S TAIL is a delightful little story of a blue-tailed skink. One day he is out in the forest eating ants, when a crow tries to eat him. The skink disconnects his tail, which wiggles and distracts his predator long enough for Little Skink to escape. He's glad he's alive, but misses his tail, and spends most of the rest of the book wondering how other tails might look and work on his body. I know my primary grade friends will love this book. 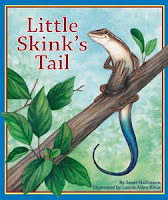 First, they will be fascinated by the idea of the skink losing his tail (An afterword includes several activities about animal tails and footprints, I would have loved to see a page with photographs and information about skinks). I know, too, that my little guys will love joining in on language like puffy-fluffy, sticky-prickly and stinky, stinky, stinky, and I envision myself reading this book over and over again. I also picture our littlest readers picking up this book and reading it to each other- the strong story line and fun language will make it a sure winner. An added attraction- Sylvan Dell has a website with cross curricular activities related to the book. I especially liked those related to science and math. Activities include a skink diagram to label, a map about skink habitats, animal cards to sort and classify, an activity about the purposes for tails, and websites to check out. Some really nice, rich thinking activities for our little guys. I've been working with my primary grade teachers on how to make their literacy stations richer and more interesting, and any of these activities would be terrific. I know how a reading conference is supposed to look. I'm supposed to sit down next to a child, clipboard or neatly organized notebook in hand, and ask the child a rapport- building question like, "How's it going?" Then I'm supposed to listen to the child read, chat a little about the book to determine whether or not the reader is understanding, point out reading strengths, and help the child set a goal, or add a new reading strategy to their repertoire. For the past few weeks, though, some of my reading conferences have taken a decidedly different twist. About two weeks ago, J brought her book to me. At that time, she was reading GREETINGS FROM NOWHERE by Barbara O'Connor. J is a fifth grader, reading at a beginning third grade level. At the beginning of the year, she was just starting to read chapter books, mostly stuff like Junie B. Jones and a little MAGIC TREEHOUSE. My first read aloud with J's group was HOW TO STEAL A DOG by Barbara O'Connor. J asked if she could read it for independent reading. She pretty much stayed right with me, rereading the chapter I had just read aloud. She went on to read MOONPIE AND IVY, GREETINGS FROM NOWHERE, and is now starting FAME AND GLORY IN FREEDOM, GEORGIA. Today she brings the book to me. "Will you just read me a little?" she says. "It's kind of hard." She is only three pages in, so I ask if she would mind if I started at the beginning. I read aloud the first chapter and a half, and we chat about the characters and the setting. We wonder why Barbara O'Connor always uses "weird" names for her characters. We compare Bird, the main character in FAME AND GLORY to Georgina in HOW TO STEAL A DOG. We talk about how this book is set in the South, just like GREETINGS FROM NOWHERE. By the time we are done, J is clear on the character and setting, and is beginning to have a sense of the story. It's kind of like I have "jump started" J, I've taken energy from my reading battery and given J a little charge to get her going. A day or so later, D's hand waves wildly during independent reading. I'm a little surprised, because one of my sacred and inviolates during this time is NO INTERRUPTIONS, NO BATHROOM, NO WATER, NO MOVING, NO NOTHING. D wants to know if I will read with her, like I did with J. I need to confer with her, so I sit down on the stair beside her. D's needs are very different, however, than J's. D has been a Junie B reader all year long. She's recently started the CLEMENTINE series, and is loving this new friend. The books are probably just about right in terms of reading level. D, however, needs help on stamina. She can read for about 20 minutes by herself, and then she gets really restless and wriggly. Today, I sit with her for the last seven or eight minutes of reading. We trade off, she reads a page, then I read a page. Again, we chat about the book, giggle over Clementine cutting her friend Margaret's hair with a pair of plastic art scissors, compare Clementine to Junie B. Our few minutes help build D last the entire thirty minutes. I wonder if it will build her reading stamina if I make a point of trying to read with her the last few minutes of reading time every few days, until her body can get used to sitting still just a little longer. Yesterday, I sat with B. B's family has had a rough, rough year. At one point, we even thought the family was living in their car. I was in B's fourth grade classroom working on writing this morning, and he looked exhausted. During reading, I just wanted to check in, to make sure he was ok. B was reading from the STINK series. In this particular book, Stink's class visits a museum exhibit, and Stink gets cajoled into smelling a variety of unpleasant odors. The chapter is hilarious, and I am glad to see B laugh. I hope he takes away the message that reading can take us out of our ordinary lives, and into some place that is easier and more fun. That message of escape has served me well in my life as a reader. So in the past few days, I've done three good reading conferences. None of them has followed the typical format. None has involved copious notes, or running records. We haven't set any of our usual goals. And yet, I fully believe that all of these conferences have changed these readers, and helped them to grow bigger reading selves. And when all is said and done, isn't that our real purpose as teachers of reading? For the past few weeks, I've been writing poetry in a kindergarten class. Today will be our last day together, because I will spend the next few weeks administering the CSAP to a group of fifth graders. I've found the perfect farewell read aloud- BELLA AND BEAN by Rebecca Kai Dotlich. 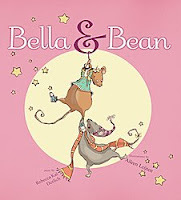 I first read about BELLA AND BEAN on the Year of Reading blog two or three weeks ago. Franki said, "A book about poetry and a book about being a friend. What could be better?" I couldn't agree more! Bella is a poet. She likes sitting in a chair, thinking of beautiful words, and writing poems. Bean, on the other hand, is a going kind of gal. She likes walking to the pond and planting snow bushes. The fact that these two good friends care about such very different things causes more than a little "friction" in their relationship.